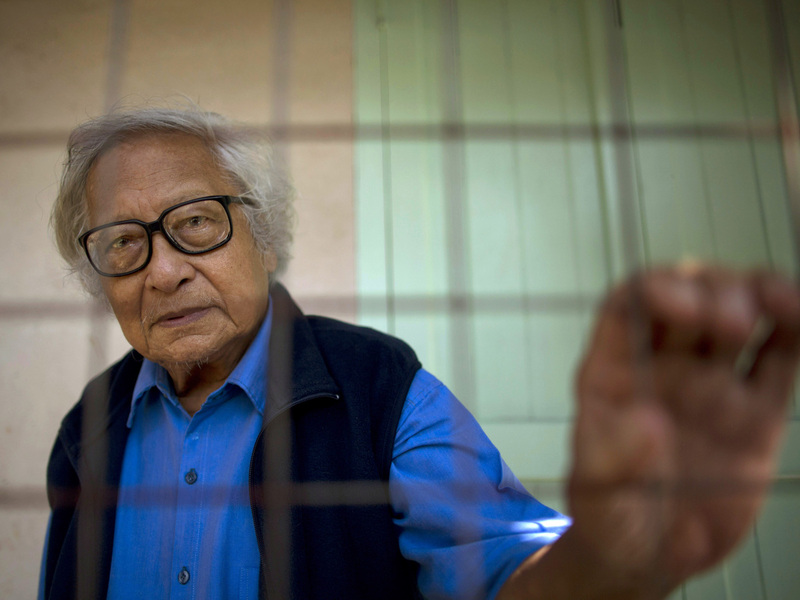 Win Tin, Myanmar's Longest-Serving Political Prisoner, Dies : The Two-Way The former newspaper editor, who co-founded the National League for Democracy with Nobel laureate Aung San Suu Kyi, spent 19 years in prison until his release in 2008. He died Monday of organ failure. Win Tin, pictured at his Yangon home in 2013, was a prominent journalist who became Myanmar's longest-serving political prisoner after challenging military rule. Win Tin, a former newspaper editor who became Myanmar's longest-serving political prisoner for his pro-democracy activism, has died. News reports gave his age as 84 or 85. The Associated Press reports that he'd been hospitalized since March 12 in Yangon with respiratory problems. The cause of death was organ failure. "Win Tin was jailed in 1989 and harshly treated — tortured, denied medical treatment and kept in solitary confinement. He would later recount in a memoir how his jailers refused him pen and paper, so he ground up bits of brick into a paste that he used to write poetry on the walls of his cell." A spokesman for the NLD called him a "great pillar of strength." Win Tin was freed in 2008, along with hundreds of other prisoners, as part of a general amnesty by Myanmar's ruling junta. Still, he continued to wear his blue prison shirt as a mark of solidarity with other political prisoners in the country. He also continued working with the NLD until Myanmar transitioned to an elected government in 2011 (though as the AP notes, the government is still dominated by the army). Win Tin was a close ally of Suu Kyi, who won the Nobel Peace Prize in 1991, but was critical of her in recent years for what he saw as her conciliatory relationship with Myanmar's military leaders. As Reuters reports, "He publicly disagreed over her decision to run in April 2012 by-elections that took the NLD into parliament, arguing that the party's participation lent authority to a government packed with former generals." Still, he praised Suu Kyi's commitment to democracy. He told Reuters in 2010 that he "was cut out to be a journalist rather than a politician." The news agency said a funeral is to be held Wednesday.